If you have any questions or suggestions you are welcome to join our forum discussion about Trending Trading Ranges in Stock Trading. Previously we covered trending trading ranges in general and now it is time to discuss this type of market behavior particularly in stock trading due to its unique peculiarities that are linked to the stock markets’ trading hours. Generally, trending trading range days begin with an opening range which is 30-50% the size of the recent days’ average range. Usually the day’s first trading range is broken out of an hour or two from the opening and the market enters another higher or lower trading range, just like on the following screenshot. 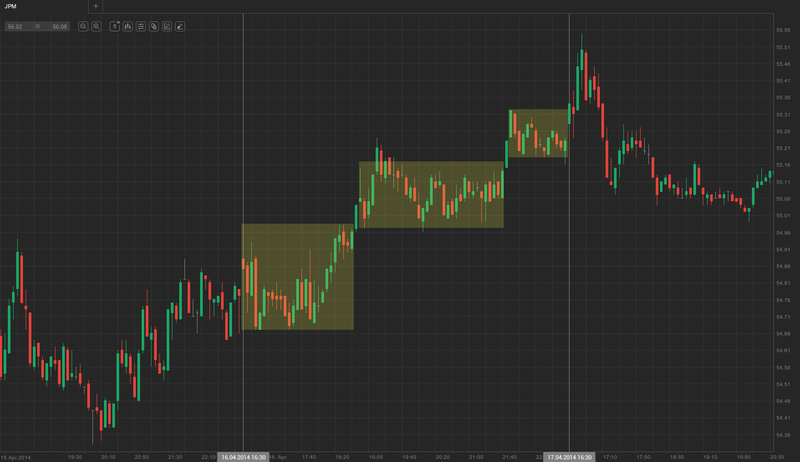 Usually, as the second range begins to form, there is a pullback testing the previous range. Often it succeeds to break back into the previous range, but if it does not, then the trend is considered stronger. However, the stronger and the more sustainable the breakout is, the higher the chance is for the day to become a spike plus channel trend day, instead of a trending trade range day. 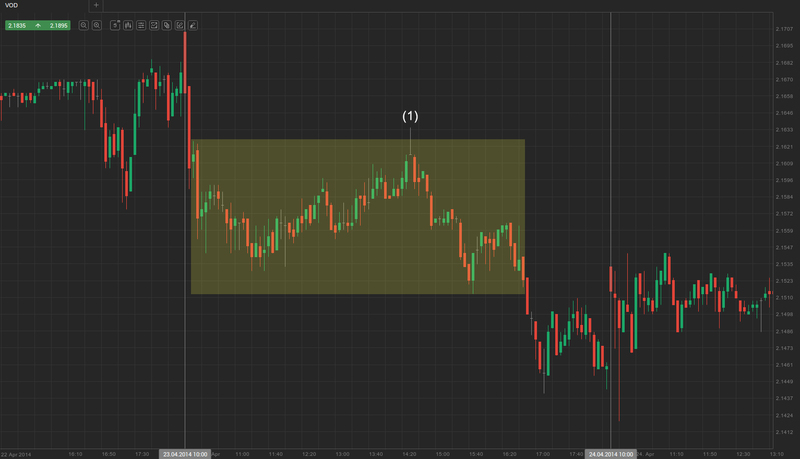 If the pullback however manages to extend beyond the lower trading range, then the day turns into a reversal day. Most reversal days begin as a trending trade range day. Since trend pullbacks are basically a trading range, trending range days, or at least a portion of them, can be seen during each trend day, rendering them a very common occurrence. These trend days are made up of several trading ranges, which transition into each other via breakouts. The opening trading range tends to last between one and three hours and, as noted above, is usually wide 30%-50% of the recent days’ average range. It reflects the market’s unwillingness to perform any steep moves and the lack of urgency. This sentiment suggests the day will likely not become a strong trend day. Moreover, the initial trading range has the so-called “Vacuum effect”, which pulls the price back as it breaks out from the trading range, not allowing it to move too far away, thus forming a second range close to the first one. There is a distinct difference between the spike of a spike plus channel trend (day) and the spike (breakout) which acts as a transition between two trending ranges. The spike of a spike plus channel trend day usually happens in the beginning of the trading day. It consists of several large trend bars with small shadows and little overlap. It can also be a large opening gap. Regardless whether it is a succession of strong trend bars, or a large gap, it usually breaks above or below the previous day’s high or low, whereas the spike in a trending trade range day usually remains within the previous day’s range. Moreover, it is composed of fewer bars, which commonly have smaller bodies and larger shadows, and the bars overlap each other. If the pullback from the breakout goes sideways for several bars or enters a weak channel with overlapping bars, then it is usually a trending trade range day. Conversely, if the pullback is a single large bar and the breakout from the pullback is another spike, then this will likely be a channel trend day. Generally, if the pullback from the breakout is strong enough to make traders hesitate to enter with-trend, then a trading range is more likely to occur than a trend channel. When the day begins with a trading range that is as much as half of the recent days’ range and if the breakout from that range begins late in the day, you shouldn’t expect the breakout to form a strong trend. Instead, more often it pulls back and the market forms a higher/lower trading range instead of entering a strong trend. Check out the screenshot below. As you can see on the example above, the market opened with a significant sellout with two consecutive sell climaxes, paused by the first bull trend. Another bearish trend bar followed, after which the three bullish bars, with shadows exceeding their bodies, and a doji presumably indicated that this might be a trending trade range day at most, if not a trading range day. The market later formed an upward sloping trading channel, which however did not display too much of an upward pressure, as evident by the large amount of doji bars within it. As we’ve mentioned in the article “Overview of channels“, each channel, especially if displaying some signs of weakness in momentum, can be seen as a type of sloping trading range. Moreover, the high of the upward sloping channel, at (1) marked the end of the correction after the day’s initial sell-off, after which the price edged lower, but still remained within the day’s overall wide trading range, with the market persistently being overall two-sided. A breakout followed late in the day, but the price entered a lower trading range instead of beginning a strong trend. In general, because both bulls and bears see value in the market on such days, the trading ranges’ vacuum effect causes the price to often pull back to the breakout area. We said in the previous article that as soon as the breakout reaches 50% of the average daily range, market players counter-bet strong trend bars, which might drive the market back up to the bottom of the initial higher range. If the market enters once again the initial range, it will often test its top, especially if that happens in the final hours of the trading day. If the day closes at the top or above the average day, it is a reversal day.